We announced last month that New Zealand Shores is now an agent for the University of Waikato. As agents, we can advise on courses and facilitate both your enrolment and your visa process. Why the University of Waikato? 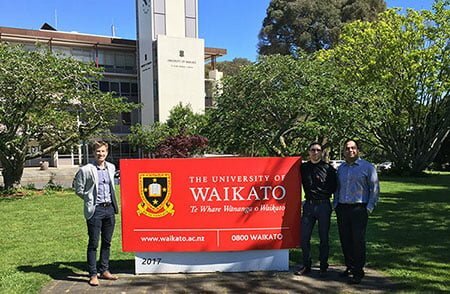 Our team have recently been meeting with the University of Waikato staff, viewing their extensive on campus facilities and we have been very impressed with what is on offer for International students. The courses on offer are outstanding and we would strongly recommend the University of Waikato as an option to consider for your New Zealand studies. Why? Because the University is amongst the top 1.1% in the world, has one of the best campuses in the country, is conveniently located in Central North Island, and is a Triple Crown Accredited Business School. Courses designed for international students include a Master of Professional Accounting, an internationally recognised masters degree that will prepare you to launch a professional career in accounting after just 14 months of study. Also notable: a Master of Information Technology that moves students beyond the theoretical through to supervised project-based learning and on-the-job experience with industry partners. These are only two of the many options available. The University of Waikato has a selection of Pathways to facilitate your entry into tertiary courses such as Bachelor Degrees. You can study intensive English courses to get you to the right level for your study goals. There are also Foundation Programmes available, and which can be used in combination with English courses. A number of scholarships based on merit are available from the University’s International Office, but also each university branch may have their own programmes to reward academic excellence. Enquire through New Zealand Shores as an agent and we can discuss options available. Talk to our student specialist now and find out how we can help with your enrolment and visa process.